Shodai Bizen Yasumitsu (備前康光) traces his lineage to Shigeyoshi (重吉) of the Kagen era (嘉元) of 1303, who descends from Mitsutada (光忠). Shigeyoshi (重吉) was the son of Kagehide (景秀) of the Kamakura era. During the Oei era (応永) beginning in about 1394, we find a sudden flourish of excellent sword making by Yasumitsu (康光) and Morimitsu (盛光). 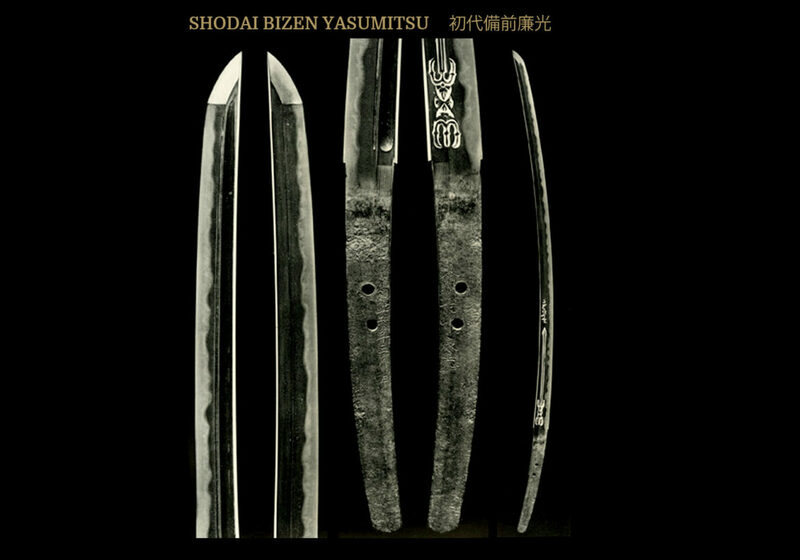 There were several generations of smiths in Bizen by the name of Yasumitsu (康光) but the shodai is considered to have been the most skilled. Most of his works are signed in two characters but he did use a longer mei on occasion. Yasumitsu (康光) worked from the latter part of the Oei era (応永) into the Eikyo era (永亨) and the majority of his works will be dated. Yasumitsu(康光), together with the smiths Morimitsu(盛光) and Moromitsu(師光),were known as the Oei no San Mitsu (応永の三光) smiths and all are considered very famous and excellent. The Nidai Yasumitsu (康光) followed the shodai in the Eikyo era (永亨). It is thought that there were an additional two generations of Yasumitsu (康光) smiths but works by the generations after the nidai are not often seen. The second generation (Nidai) of the Yasumitsu (康光) line was known as Sakyônosuke Yasumitsu (左京亮康光). His father, the first generation, was known as Uemonnojô Yasumitsu (右衛門尉康光). The earliest works for the second generation seem to be about Oei (応永) 28 (1421) and he continued working into the Eikyo – Bunan (永享-文安) period (1429-1444). His works closely resembled those of the first generation and it can be said that he worked in Oei Bizen (応永備前) style. The line between the first and second generations is somewhat unclear, but according to the Kumano Manuscripts in Oei (応永) 29 (1422) the second generation presented a tachi to the Kumano Temple. This was one of the first references to the second generation. The smiths, Yasumitsu (康光) and Morimitsu(盛光) are both regarded as the most skilled and representative smiths of the Oei Bizen (応永備前) period. Their works are very similar and differentiating between the two smiths can be very difficult. While there are a great many examples surviving from both of these smiths, there are a greater number of works of Morimitsu(盛光) remaining than those of Yasumitsu (康光). There are good pieces among the niji-mei works of both smiths. SUGATA: There are tachi, katana, and wakizashi of both shinogi-zukuri and hira-zukuri, but tanto of less than 30 cm in length are rare. There are no extant examples of nagamaki. 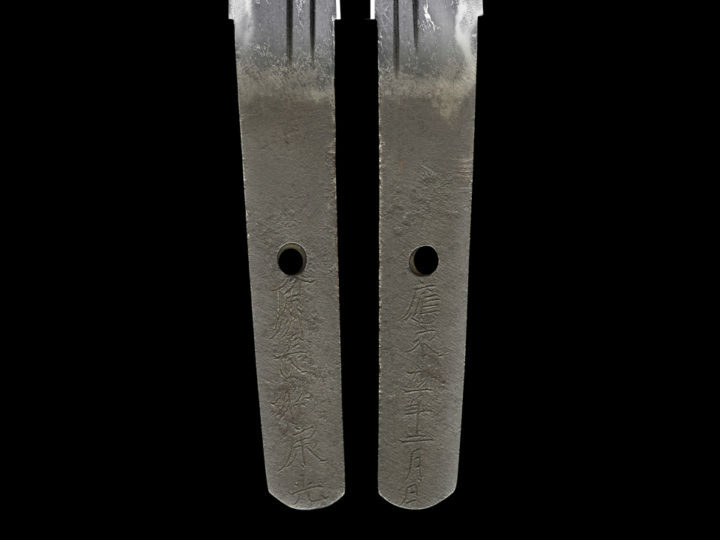 The exaggerated and ostentatious sugata that was in fashion in the preceding Nanbokucho period disappeared and was replaced by thinner blades exhibiting a pronounced saki-zori. These smiths seem to have set out to copy the tachi sugata of the Kamakura period, but theirs is differentiated by a shallow saki-zori. The nagasa is about 70 cm in tachi, and 50 cm in wakizashi. The production of katana and wakizashi was begun in this period. Katana are similar to tachi, but their saki-zori is deeper and the nagasa is shorter than seen in tachi. Wakizashi generally have a narrow mihaba, small kissaki, and saki-zori. The nagasa of hira-zukuri ko-wakizashi became longer than in the preceding period, but the mihaba grew narrower and the sori is very shallow, sometimes even mu-zori. JIHADA: The jigane is soft and the jihada is generally itame hada with some areas of mokume-hada mixed with o-hada. Clear bo-utsuri and midare utsuri appears. Sometimes even when the hamon is midareba, the utsuri can be bo-utsuri, but midare utsuri is also seen on blades with this hamon. An important kantei point of the Shodai Yasumitsu is the fact that one often finds areas of partially straight grains mixed in with the typical itame. HAMON: The hamon is nioi based. The thick nioi line is soft and hajimi are seen inside the hamon at times. The shape tends to be koshi-no-hirata midare mixed with choji-midare. Also suguha mixed with ko-midare is also seen. One also notices the Oei trait of a wide spacing between the midare patterns. HORIMONO: Bo-hi with soe-hi or tsure-hi is quite common. The top of the hi is located just above the yokote. The bottom of the hi is finished around the machi. Horimono are often seen on wakizashi, with the same design often appearing on both sides of the blade. Ken-maki-ryu or the names of the gods and deities are engraved on the omote and ken with dokko, tsume, or bonji on the ura, while bo-hi with soe-hi or tsure-hi whose bottoms are maru-dome are usually engraved in the above horimono. NAKAGO: Shorter and less tapered nakago with kurijiri. Cho-mei (long signature) including the date is found but a great many swords have only the niji mei Yasumitsu (康光). Because of the great number of katana, wakizashi and tanto produced, the katana-mei became common yet tachi-mei is still found on tachi as is appropriate.